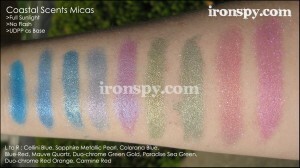 iron spy » Some Coastal Scents mica swatches. Huzzah. 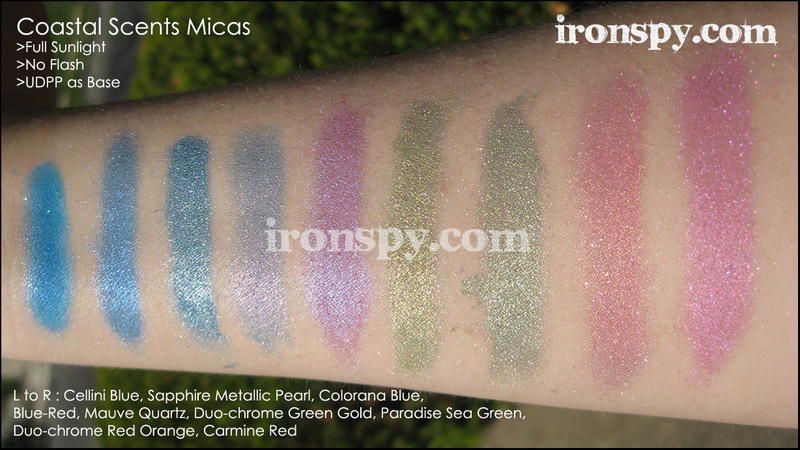 Some Coastal Scents mica swatches. Huzzah. By Laura. Posted April 28, 2009 at 8:40 pm. On occasion, I have forgotten I’ve owned some things I have, in fact, owned. Meaning, I have so much makeup I can’t keep track of it all and often forget what I have. Therefore I am beginning the arduous task of documenting my makeup in order to keep a photo record of what I have. No more shall I purchase (and purchase again) products very similar to things I already own. Yes, child, this is a glorious day. I’ll start up with something I’ve been accumulating a lot of lately, as they are so cheap: Mica powders from Coastal Scents. These are rather pigmented, but of course you need to wear a primer if you are wearing them as eyeshadow (which is what I almost always do). 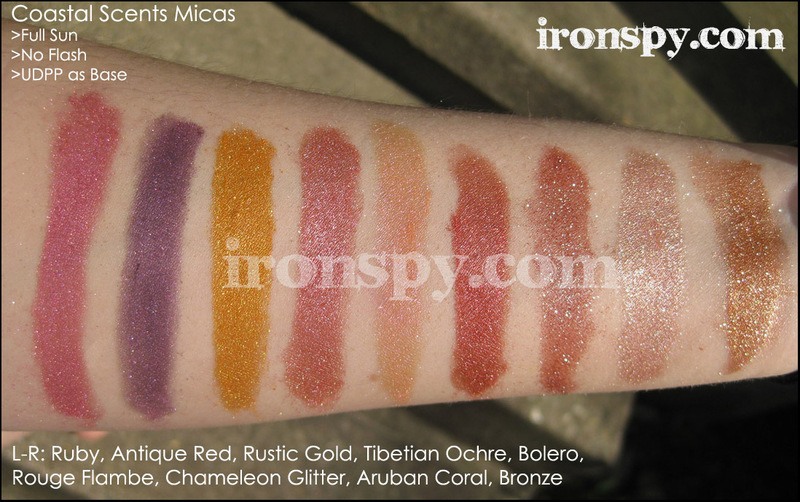 In these pictures, I swatched them on a base of UDPP. Anyway, as I said, they are rather pigmented but there is a lot of fallout if you have too much on your brush. I rather take a little extra time and layer it on slowly to reduct any fall out. These are also very pretty foiled. Interfine micas and Inter Spark micas are intended (at least as far as I can tell) for use with other things, i.e. mix with lipgloss, layer over a shadow to add dimension and sparkle, etc. Interfine provides more of a sheen of whatever color it is (in my pictures, this is violet, duh) over whatever base you put it on. It would look great over any black, and I’ve seen photos of a blue Interfine over a black shadow looking amazing. Inter Spark micas are one step up from the Interfines, providing a sheen with more of a sparkle. 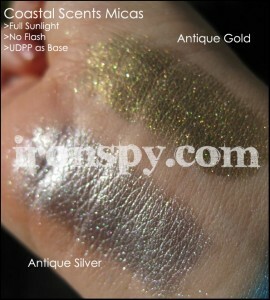 The Ultra Shimmer mica also in this picture is just simple silver shimmer (one step below a glitter powder). 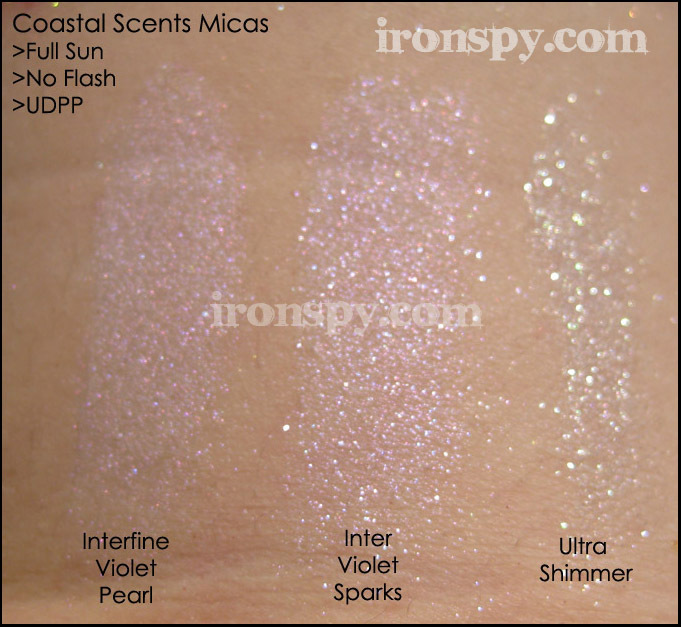 As a final note, I think you can get these micas elsewhere, but I refer to them as “Coastal Scents” micas simply because that is where I purchased them.